My Best Binder Page #2 – 1997 SP Buyback Autographs Ken Griffey Jr.
It’s kind of amazing this isn’t the top card in my collection. It’s close, but I think the story behind card #1 is pretty compelling. This card is pretty amazing, too, however. I’ve pulled a Jeter auto #’d to 5 out of 2008 Upper Deck Heroes, and a Prince Fielder SPX signed rookie card. I’ve pulled a Hank Aaron autograph from 2012 Topps. 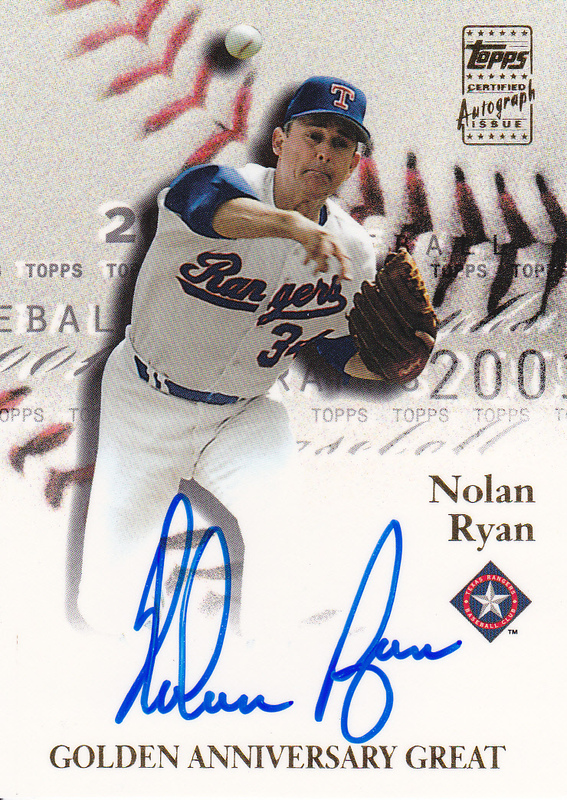 I’ve pulled a Nolan Ryan auto from 2001 Topps – and it made this top 9 countdown. But nothing, and I mean nothing, beats pulling a rare card of your favorite player. I found this card in 1997. I had gone away from collecting for most of 1996 and 1997, however there was one exception. I still collected Upper Deck SP. I bought one box that year. And I pulled this card. Upper Deck had been inserting autographs into packs since 1990, but I had never pulled one. And the buyback concept was very new. It may have originated from this product, I’m not sure. It was a good idea to me. Unlike cards that were newly-made for the current product, buyback autographs seem more akin to getting an autograph at the ballpark. If I could catch Griffey signing after batting practice – it would look something like this. This card was from the year before – his ’96 SP card, and was #’d out of 312. That was the highest print run of his buyback autos that year, but it is easily my favorite card I’ve ever pulled from a pack. 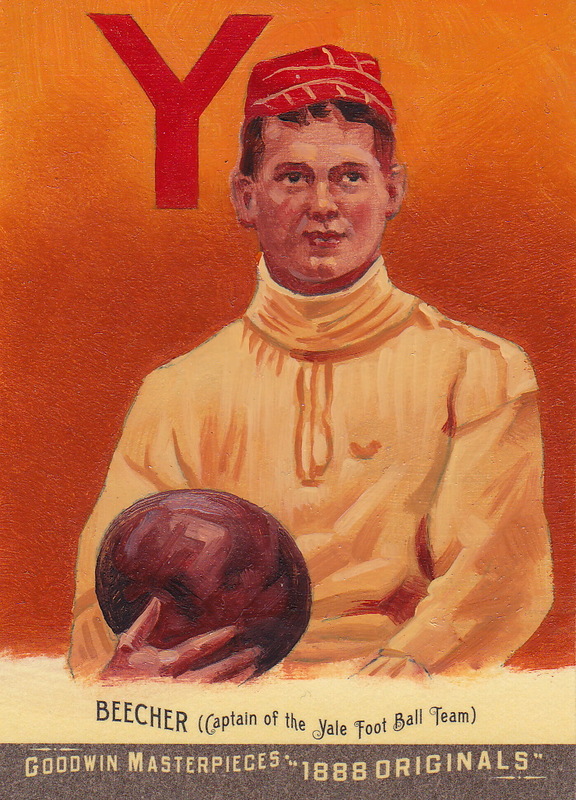 The 1888 Goodwin Champions set contained the first ever card of a football player. 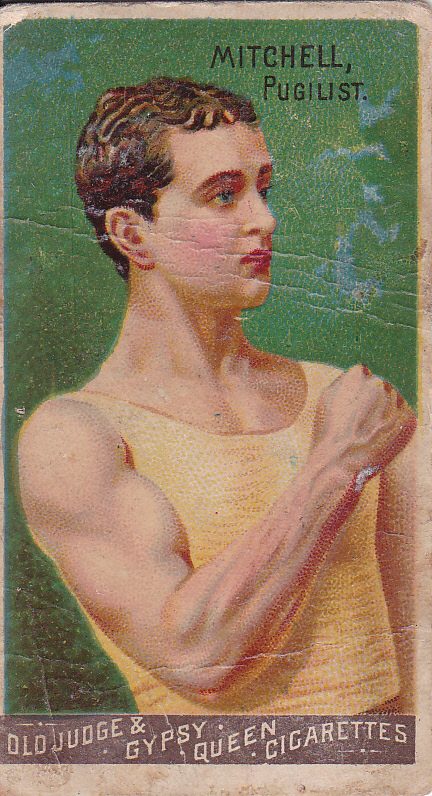 Professional football was still some time away, so that card was of Yale captain Harry Beecher. Beecher was the great-nephew of Harriet Beecher Stowe – the author of Uncle Tom’s Cabin. There’s a good write-up on the Yale captain at this link. Beecher still holds the Yale record for the most career touchdowns (66); he once scored 11 TDs in one game. I was looking for this card for well over a year. A few months after Goodwin 2012 came out, it popped up on eBay and sold for over $300 both times. That was too rich for me, though the trouble I had finding a 2nd card for sale meant I would think about paying that much if it came up again. I got if for about $150 a year later, around Thanksgiving 2013. It’s not as nostalgic as some of the other cards I’ve posed about, but it’s easily one of the 2 or 3 favorite cards that I own. My Best Binder Page #4 – 1989 Upper Deck Ken Griffey Jr.
I’m into the top 4 from my “best binder page”. The next 4 cards all have some particular meaning to my collection. To me, there is a top 3 of iconic cards in the history of the hobby. The T206 Honus Wagner. 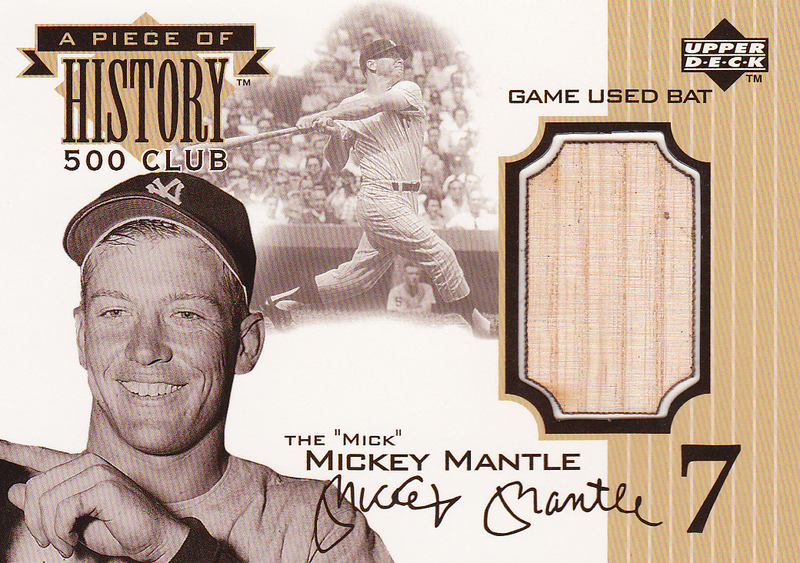 The 1952 Topps Mickey Mantle. 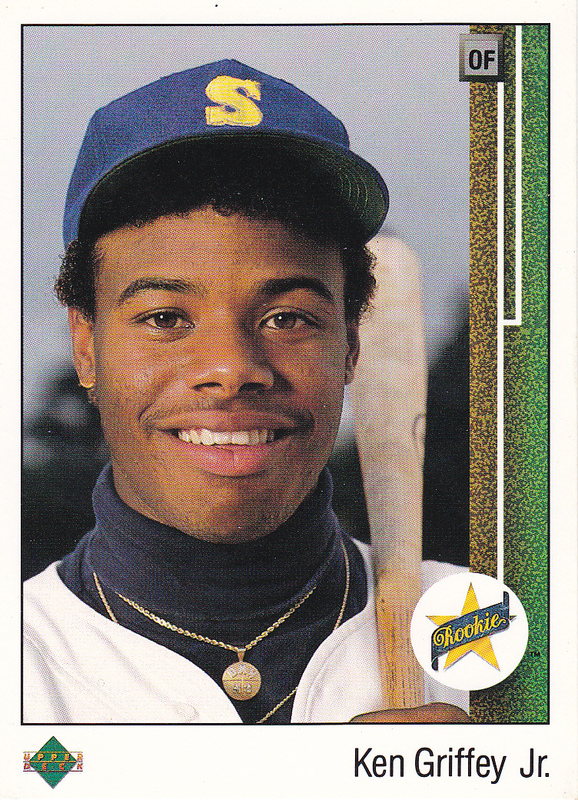 1989 Upper Deck Ken Griffey Jr.
Only one of those 3 is attainable for the average Joe. And I have that card. Actually, I have 2, but this is one I pulled from a pack about 20 years ago. At the time, even this card didn’t seem attainable because it was selling for just under 100 bucks a pop. In late 1988, through connections with a couple of California Angel players, Upper Deck was able to wrestle a 5th card license from Major League Baseball. Their card/hologram connection was supposed to lessen the risk of counterfeiting which had become more common as the value of iconic cards like the Mantle or Wagner rose. They were charging a whopping 99 cents per pack, which was 2.5x a Topps pack. Their packs were “tamper-proof”. They printed their cards on paper stock that seemed cleaner than cardboard. They put color pictures on the back, and in general took a more fun approach to pictures on baseball cards. They had a fresh card design. 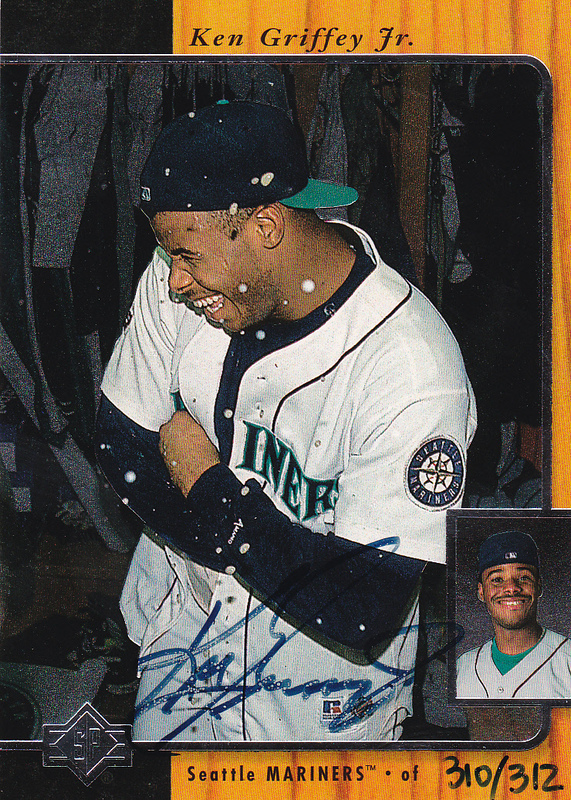 And they picked a young rising star, Ken Griffey Jr., as the #1 card in their inaugural set. In 1993 and 1994, I was going to at least 1 card show a month with my mom, probably more like every other week. In addition to collecting cards from that year, I would usually buy one of two packs of cards when we left a show. The first was 1993 SP, which I talked about with card #9. It was probably going for 5 bucks at the time. The other was 1989 Upper Deck, which probably cost the same, maybe a bit cheaper if you got the high numbered packs. In one of those 89 UD packs, I pulled the holy grail, and I’ve held onto it ever since. If I had pulled a second, I would have sold it, but I never did as a kid. Years later, I bought a box and got one – that’s what’s sitting in my almost-complete set. This card sits separately as its own piece to my collection. On to the 5th card in my “best binder page”. Junior Junkie came up with a great idea – out of all the cards in your collection, what are your top 9? What’s your best binder page? I’ve been collecting the Upper Deck Piece of History cards since before I started this blog. I’m collecting this set (500 Home Run club) and the 3,000 Hit club as well. Like my Jalen Rose collection, it’s is a set that doesn’t get much airplay here. It’s just not the premise of this blog. 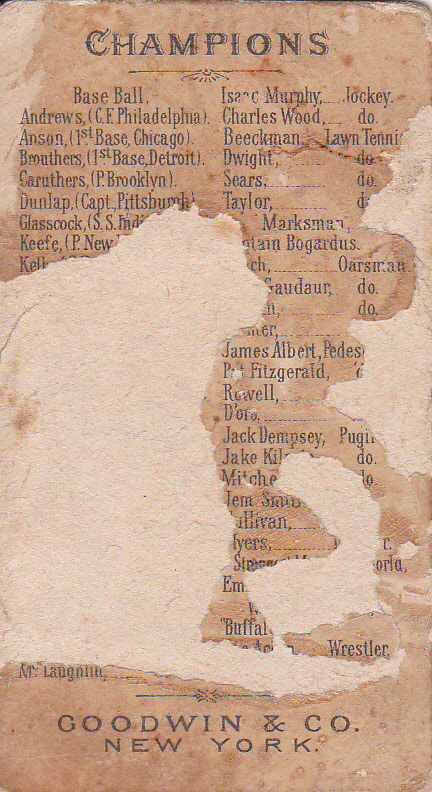 In fact, I don’t know if I’ve ever scanned one of these cards onto the blog until now. It is a set I have been ever so slowly completing, though I don’t think if I’ve added a card in the last year or two. That’s mostly because I’m getting closer to finishing both sets, and these cards are hard to come by. In 1999, Upper Deck created these incredibly popular Piece of History cards of members of the 500 Home Run club. They inserted them across Upper deck products that year, with some leaking over into 2000. They also started a similar set for 3,000 hit club members in 2000. 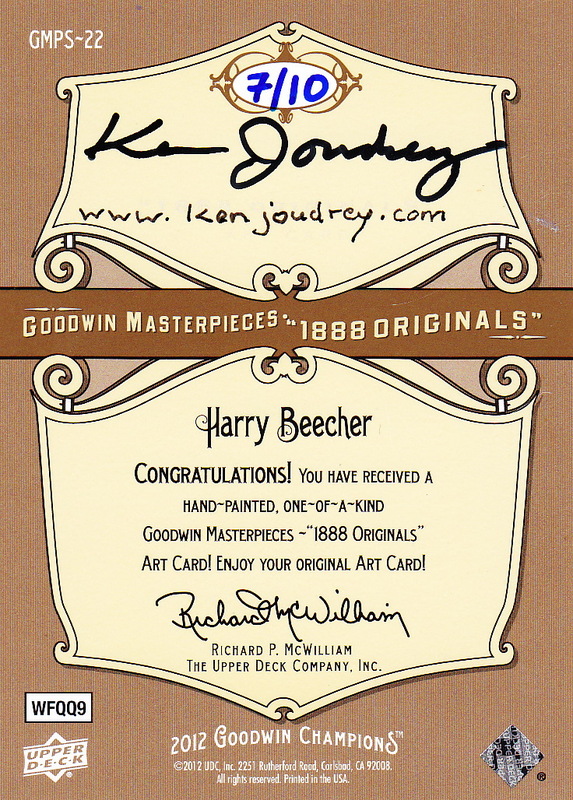 This particular card was inserted into Upper Deck Ovation in 1999. All of the cards had a production run out of 350, though they aren’t numbered. The lone exception is the Babe Ruth, which only had 50 made and would cost about a grand to purchase. I don’t have the Babe Ruth, so this card is the most impressive one that I own from the set. I think I’ve actually had it for 6 or 7 years, and if I remember right I bought it for about $300. It’s definitely a worthy representative in my top 9! This is the 2nd, and last, non-baseball card from my top 9. I have over 1,000 Jalen Rose cards, so I definitely felt like I needed to include a Jalen Rose card in my top 9. I didn’t have to think very hard. 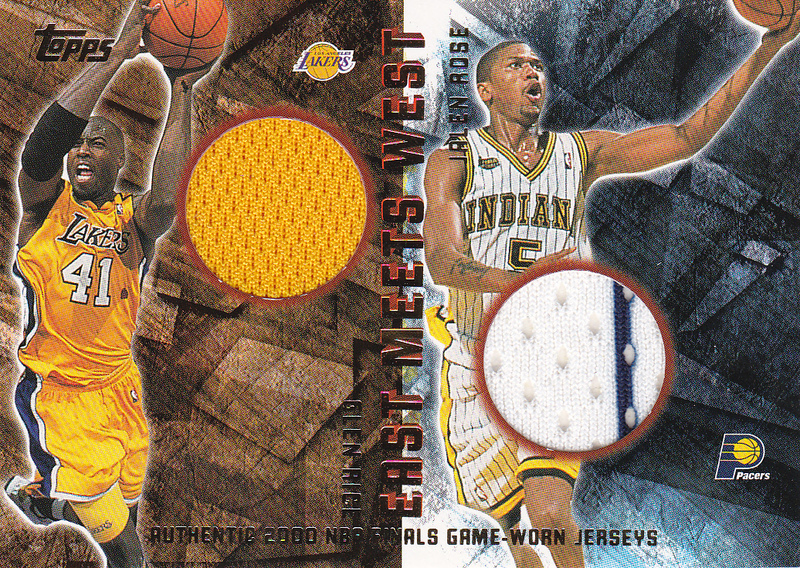 While there were a few other Jalen Rose cards that were in the second 9 – I knew this card would be included without having to go through my collection. My parents went to Michigan, and I’ve always been a fan of the Maize and Blue. The Fab Five really sparked me into becoming a sports fan, and Jalen was my favorite player on those teams. I followed him all through college and the pros, and continue to do so now that he’s an ESPN analyst. Jalen is best known for being a member of the Fab Five, but he also had a great NBA career. He played 13 seasons, averaging 14.3 points per game. He was the highest scoring player on a team that made the NBA Finals (99-00 Pacers), and he had 3 seasons where he averaged over 20 points a game. He’s one of the best players who didn’t ever make an All-Star game. Aside from an autograph card with Chris Webber and Juwan Howard – it would be hard to knock this card off the top pedestal. It’s a jersey swatch from the 2000 Finals, when Indiana lost to the Lakers. But the other guy on the card is particularly appropriate. Glen Rice was nearing the end of his career, helping the Lakers to that title. Rice is one of the few players who surpasses Jalen as far as his Michigan accolades. He was the Most Outstanding Player of the 1989 Final Four, leading Michigan to their only National Championship. Next up is the 7th card in my “best binder page”. This one finishes up the bottom row. If you’ll remember, Junior Junkie came up with a great idea – out of all the cards in your collection, what are your top 9? What’s your best binder page? So far, I’ve had a 1993 SP insert and a 2001 Topps autograph. Two fairly new cards. Both are glossy. One is die-cut. The other has an autograph. This card has neither. It’s from 1888. It’s boxer Charley Mitchell was an Englishmen who probably had the closest argument with John Sullivan as the greatest bare knuckle fighter. The back is about half in tact. But it’s the oldest card in my collection. And I have the Upper Deck 2012 painted version from 2012 version, which is outright cool. Moving on to the 8th card in my “best binder page”. If you’ll remember, Junior Junkie came up with a great idea – out of all the cards in your collection, what are your top 9? What’s your best binder page? Yesterday, I talked about the Tim Salmon insert card from 1993 SP and the nostalgia I can draw up by seeing that card. This was another excellent pull – in fact, it was much rarer than the Salmon card. I got this card in one of my 2001 Topps boxes, and it was a pleasant surprise since 80% of the box was damaged. And while a 35-year-old can’t replicate the excitement of a 13-year-old kid, I was pretty damn excited about this card. Plus, it was Nolan Ryan, who is kind of like my generation’s Mickey Mantle. So that makes it approach the nostalgia. I love that this card was a pull along the way while I’m doing this Lifetime Topps Project – sort of collateral addition to my collection. And it’s an autograph of Nolan Ryan for Pete’s sake!